Fabrizio was fantastic! We had a 3 hour walking tour of historic Naples on April 8. He listened to our interests and tailored the tour exactly to us. His knowledge of the long history of this city is amazing and his enthusiasm is great. His English is perfect. We would highly recommend him! Fabrizio met us at the Napoli train station and transported us to the Pompei site. The tour was very informative. He provided us with a picture of how life in Pompei was and kept the tour interesting for our two children. Fabrizio also gave us recommendations for pizza restaurants in Napoli. This is something you must try if you are in Napoli. Thanks Fabrizio! We had a wonderful day with Fabrizio. 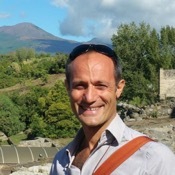 Fabrizio has extensive knowledge about all aspects of the sites we explored in Pompeii and Herculaneum. The lunch suggion at the winery was excellent. The whole day was relaxed and flexible to our requirements. We have no hesitation in recommending Fabrizio as your tour guide. Fabrizio is wonderful, an excellent cultural navigator. He is sophisticated yet totally engaging, with an amazing depth of knowledge about the many intricacies of Neopolitan history and culture, which he conveys in a warm and thoroughly accessible manner. We did a private tour of Paestum with him a few years ago. Naples is a bigger challenge, and his suggestions helped shape our itinerary to make a perfect day for us. Cannot recommend highly enough. Fabrizio was very knowledgeable and it was a pleasure to spend a day with him visiting each location. He recommended a lovely place to eat. We were returning customers and will definitely book again with him next time we come to the area. He was fantastic with our children and brought Pompeii to life for us. Vesuvius was amazing and he swapped around our itinerary so we had a better experience by going there later in the day when the clouds had cleared. Overall a day we will never forget, thank you. I wish I could give 10 stars to Fabrizio ! Fabrizio is an excellent tour guide, one of the best I have ever seen. He is very knowledgeable, entertaining and incredibly friendly. Fabrizio was able to engage our teenage son, make the Pompeii tour fun for him. Fabrizio made history come alive for us. Fabrizio's Pompeii tour was the highlight of our experience in Naples. We will make sure to book more tours with Fabrizio when we come back to Naples. I highly recommend hiring Fabrizio! Fabrizio was an absolutely fabulous guide--if I could give more stars, I would! His deep knowledge of both Pompeii and Herculaneum truly enhanced our experience, helping us to understand the sites in ways we could not have done on our own. The lunch he arranged for us was wonderful--excellent food and wine--and the experience provided greater insight into Italian food and culture. All of this, and he was just a super nice guy! We highly recommend his tour! Fabrizio provided an amazing experience. He tailored the tour to exactly what our group wanted and was very flexible throughout the day based on our feedback and requests. The place he selected for lunch was excellent, with delicious local food! Fabrizio was a fabulous tour guide! This tour provided exactly the right mix of fun & games to amuse our daughters (5 & 7), and also lots of interesting history for the adults! Fantastic tour. Fabrizio was so attentive and his knowledge was amazing, well worth the money. I highly recommend him for any tours. Thank you Fabrizio. Wonderful tour for our family. Kids age 11, 8 & 4. Fabrizio kept them all interested and had fun games along the way. Good value for the money. Brought Pompeii to life. We were so glad we met for the early morning tour. Highly recommend! We had a wonderful day touring the Almalfi coast and then Pompei with Fabrizio. We got to see so much in just one day. His knowledge of the coast and Pompei was extensive and he explained the sites with just the right amount of detail. We felt very safe with his driving and he paced the walking portions to my speed. A very friendly guide that we highly recommend. Fabrizio provided our group an outstanding and unforgettable tour. His knowledge is first-rate, and he shares his expertise in a captivating manner with plenty of context. Fabrizio is professional, friendly, flexible, and highly customer-oriented. He also proved to be a god-send while driving us along the Amalfi coast! we found Fabrizio to be very helpful and knowledeable. He managed to get us around Pompeii ahead of the crowds and knew his subjects in depth. We will use him again without hesitation. We spent a day touring Pompeii and Naples with Fabrizio--he was most knowledgeable, friendly, and helpful. Our experience, from visiting the ruins of Pompeii, walking the city of Naples, having lunch at a local restaurant, and visiting the Archaeological Museuem, was one of the highlights of our 17 day trip to Southern Italy and Sicily. Thank You Fabrizio! Fabrizio was outstanding and all 6 of us would highly recommend him and take any other tour he offers. Fabrizio was very responsive in arranging the tour, and agreed to pick us up at the cruise port which was seamless. He had great information to share along the drive, and all through the amazing site of Pompeii. He was flexible with our 7yo and had great interactive games for her. We can not recommend this tour enough! I cannot say enough about our day with Fabrizio. From the very first "hello" we felt comfortable. He was SO knowledgeable about Pompei. When we left my husband said he could have spent another few hours with Fabrizio and Pompei. Just an outstanding day. Our tour of Pompeii with Fabrizio was great! He was at our port to pick us up on time, helped us navigate the local trains to arrive at our destination and was extremely knowledgeable about the site, history and everything. The scavenger hunt for the kids was a great way to keep them engaged on the very hot and sunny day, but they also learned a lot. I would highly recommend Fabrizio for your tours, with adults or kids!! Had an amazing tour with Fabrizio. We had booked a Pompei tour and were amazed by his knowledge of the region . He kept the tour very relevant and especially kept our 3 kids very engaged during the tour with various quizzes and a book that he had made for kids . In the end he recommended great pizza and other eateries and we are very impressed with his passion about what he does. Highly recommend him. Fabrizio was amazing and very flexible given the different needs of our large group. It was unfortunate that we were not able to see the Blue Grotto, or any Grotto, due to the weather, but the rest of the trip was so much fun. I enjoyed the Funiculare, and the top of Monte Solaro very much. Our day trip to Pompeii & Herculaneum with Fabrizio was truly a highlight. We had a party of five including two children ages 11 and 13. Fabrizio knew exactly how to engage the interest of not only the adults, but also the children. He is so well informed and guided us through the crowded sites with great ease and expertise keeping everyone interested and looking forward to the next discovery. We would never have seen so much on our own. We cannot recommend him highly enough. You will be delighted. Absolutely fantastic day with Fabrizio...veritable Dr Jones! Thoughtful, informed, relaxed and engaged adults and children alike. Can't recommend him highly enough! I booked Fabrizio for his Pompeii for Kids tour. He was amazing!!! I have 4 kids (9 yrs, 7yrs, 3yrs, and 2yrs old) and he entertained them our whole 2.5 hour tour, he even had my 2 year old sitting and involved. I wish I could upload a photo of my 4 kids sitting in a half circle listing to him. He did a treasure hunt, guessing games, and stickers with the kids. Not only did he keep our kids entertain he was also able to give us adults an excellent tour with so much information. Fabrizio was one of the most amazing people we met on our trip. He had worked with me to establish a very full and structured itinerary. Once we got there, he kidded me as to my insistence of the itinerary. Over the course of the day, due to his knowledge, personality, kindness and sincerity, he was able to persuade me to modify our tour and wow, I am glad that he did. He took us down the Amalfi coast and the stops we made and views we saw were incredible. Thank you so much for an unforgettable day. We used Fabrizio for 3 different tours and when we go back to Italy we will use him again as our tour guide. That in it self should say how we feel about him. After 3 days of sightseeing we thought of him as a friend not just a guide. I would highly recommend doing this tour with Fabrizio. From the moment he picked us up at our hotel to when he dropped us off at the end of the night the entire tour was fascinating He introduced us to amazing places in Italy we would have never found on our own. He is extremely knowledgeable friendly funny and professionally engaging. It says a lot when a tour guide can keep a 14 year old boy interested in sight seeing and that's exactly what Fabrizio did. We found Fabrizio to be very personable friendly knowledgeable and the perfect professional. It was wonderful to travel with him and we would highly recommend using him as a guide in any circumstance. He is excellent at what he does. His English was perfect and he was able to keep our 14 year old son engaged and interested. We absolutely loved our tour of Pompeii with Fabrizio! He met our group right on the train platform and took us on a 2 1/2 hour tour around the ruins. He was engaging, funny, knowledgeable, and excited to share his extensive knowledge of Pompeii with us. He recommended other interesting places to explore in Pompeii after we finished our tour and even told us where we could get a good lunch. We will definitely hire him again when we return to the area and would not hesitate to recommend him to others. Fabrizio was pleasant and knowledgeable. I thoroughly enjoyed my tour of Herculaneum. Fabrizio was wonderful. We were traveling with my parents who are in their 70's and my children who are in their 20's and Fabrizio kept everyone's interest. We all felt as if we were taken back to day in the life of a Herculaneum's citizen. Fabrizio made history come to life for us-from telling us about how they lived to even how a public toilet worked. Very entertaining. We even finished the day off with pizza! Our tour of Pompeii & Herculaneum with Fabrizio was the highlight of our trip! Fabrizio was incredibly knowledgeable and catered to our different interests to ensure everyone had an enjoyable time. He knew how to navigate around the crowds and the site so that we were able to maximize our time and see the most interesting things. Fabrizio was also invaluable with his other recommendations for the remainder of our trip. We loved our day with Fabrizio and cannot recommend him more highly! I can only say wonderful things about Fabrizio! We chose his tours of Naples/Pompeii/Herculaneum because of his Pompeii4Kids theme and it was such a great choice. He has worked hard to produce games, quizzes and activities for kids which really bring Pompeii and Herculaneum alive. He was able to engage the older teen and the adults as well, with well-chosen lunch spots, fascinating information, and charm. I highly recommend him and his tours. We loved Naples and were sad to leave. Thanks Fabrizio! We enjoyed a fabulous few hours with Fabrizio. Our children aged 12 and 10 were totally engaged throughout, as were we. Fabrizio was a terrific guide who shared his wealth of knowledge enthusiastically. A perfect family tour! Thank you. Fabrizio was prompt and well prepared. He mapped out our day allowing us just the right amount of time to see Amalfi and Ravello before heading to Pompeii. He was extremely well versed in the local community and the history of the sites we visited. He gave us enough time to enjoy a stroll through the two cities and a yummy lunch at a local restaurant. He sensed the desired pace of our group and catered our visit to Pompeii to our interests. I HIGHLY recommend him! Three friends and I participated in a ToursByLocals last September. This day was the highlight of our trip through Italy. Fabrizio was extremely knowledgeable about the city's history and explained all questions that we asked. One of us had some physical limitations. He went out of his way to find a less challenging walk to get from place to place. Fabrizio's sense of humor and knowledge made the day fun. History came alive for us.I would highly recommend this tour with ToursByLocals. Fabrizio was a FANTASTIC guide--pleasant, knowledgeable, and patient. We chose the 'Pompeii for Kids' tour and my granddaughter loved it. Fabrizio kept her engaged but was able to provide the in-depth information that we adults wanted. We were so glad we opted to have a guided tour. We booked a half day tour when we found our cruise line would not support a morning Naples tour and an afternoon Pompeii tour. Wow, are we ever glad it worked out that way. Fabrizio was both extremely enthusiastic and knowledgeable. Our kids both commented that he was the best tour guide we'd had throughout the length of the cruise. We visited Pompei in July. We were a large family group of 10 people, of which 4 were children aged 3-8. Fabrizio was our tour guide and he was nothing short of amazing! It was a terribly hot day and we were dealing with intermittently hot and cranky children, but none of that mattered. Fabrizio was able to keep everyone - children and adults alike - engaged and entertained. He was knowledgeable, friendly, informative and very patient! We all had a phenomenal experience and really loved Fabrizio!!!!!! Best tour ever! Mostly due to Fabrizio's knowledge of Pompeii and his ability to make it come alive through his engagement, but especially because of how he involved the kids through the use of games and activities. We learned so much more through Fabrizio, more than we ever would have by just wallking around the site on our own. He was friendly, knowledgeable, and really seemed to care that we were having fun, in a meaningful way. Highly recommend!!! Fabrizio was wonderful. We will recommend him to all of our friends traveling to Naples and the Sorrento-Amalfi coast. He is everything we hoped for in a professional tour guide. His knowledge, personal touch, sense of humor and kindness were all first class. Thank you for an amazing day. Fabrizio was knowledgable and professional. He tailored the tour to the needs of both my young son and my 67 year old mother. His knowledge of Art History and the culture of the people of Herculaneum allowed my family and I to see things that would have been invisible if we have visited on our own. Being collected and delivered was an absolute bonus too. The whole experience was so wonderful I am planning our next trip already and will (of course) be using Fabrizio again. Fabrizio is a true gentleman! He was the best guide to take our family of 5 on a full day around the Amalfi Coast. He knew all the best local spots to stop and eat/snack/take pics. He drove us around in a clean, large Mercedes van equipped with speakers so we could all hear. He is informative and entertaining and even helped us with our next day in Capri. We will definitely use Fabrizio again when we come back. Excellent and informative tour. Fabrizio was waiting for us at our hotel as arranged. He was brilliant with the kids and kept them and mum and dad enthralled throughout our journey around Pompei. Would highly recommend Tours by locals and Fabizio if taking children around the attraction. Fabrizio was a great guide in the Pompeii ruins, very well educated in the history, answered all of our questions, made suggestions for other tours, which we will look into. Great experience and will recommend. A great half-day tour through Naples with Fabrizio, who is extremely cultivated. His perfect French was also remarkable. I do recommend this tour for those who want a first impression of Naples and do not really know where to go and what to see. Outstanding tour by very knowledgeable guide. His international educational experience makes his tour extremely informative and enjoyable. Fabrizio taught us much about Pompeii. I highly recommend him as a guide. Fabrizio was a terrific guide! He was friendly, knowledgeable and his English was impeccable. I had been to Pompeii three times before, but he was still able to show us new things, and put them into context. He made an excellent suggestion for us to visit Ravello, a place we will probably want to visit again. He also made lunch reservations for us there. Lastly, I cannot say enough about Carlo, our driver. He was professional and friendly and ALWAYS looked to make our trip more enjoyable. BRAVO!! TOUR GUIDE RESPONSE: Merci Olivier! My family and I booked the Custom Tour that included a transfer from the train station and tour of Pompei. Our tour guide, Fabrizio, was wonderful! He is a knowledgeable guide. He also kept our kids engaged with kid friendly tour activities along the way. We highly recommend! Fabrizio was a fabulous guide for us in Naples, Pompei. He is a kind guide with a wealth of knowledge of the history of Greece, Roman and the Middle Ages. He answered many questions about all the cultures related to this area. He was kind enough to take us to great gelatorias and restaurants. He happens to be a great driver. You will not go wrong when you pick Fabrizio as your guide! Superior guide, able to handle a large group, will use again! We arranged a customised transfer from Amalfi Coast to Rome with Fabrizio - he could not have been more helpful. We were a party of eight with luggage - I have never felt safer being driven by his driver Fabio, even on the hairpin turns and traffic of the Amalfi. Fabio made the whole journey interesting! Fabrizio met us in Pompeii- his tour was fantastic- so engaging. Even in freezing temps, we didn't want him to stop. Thanks Fabio and Fabrizio- you were both fantastic! Had a great morning with Fabrizio. His English is excellent and his knowledge of Naples is first class. A real joy to spend a morning in his company and the icing on the cake was his recommendation of a pizzeria for lunch where we both enjoyed the finest pizza we had ever had and the prices were ludicrously cheap ! Fabrizio is a terrific guide. He is extremely knowledgeable and extremely likable. My wife and I thoroughly enjoyed our tour, which Fabrizio customized to our schedule and interests. We would recommend him to anyone seeking a private tour guide. Fabrizio is as good as it gets! Just when we thought we've had the best ToursByLocals guide ever, Fabrizio raised the bar! He is terrific. Totally knowledgable, friendly, organized, accommodating, and flexible. And to top it off his mini-van had a sound system so guests in the very back could hear him. We'd never seen that before. Don't miss a chance to use him if you can. Our tour guide was top rate. He was very informative, personable and helpful in all respects. We would highly recommend him. What an amazing character is Fabrizio. Energetic, passionate, informative, knowledgeable and fun :) Exceptional tours through Pompeii and Herculaneum gave us the behind the scenes information that would be lost on the average visitor. Fast and efficient service, prompt and attentive. We could not recommend Fabrizio any more highly. Thank you for an amazing tour that will stay with us for a very long time. This tour was beyond our expectation. Both Fabrizio and our driver Carlo were professional, knowledgeable and personable. Fabrizio took us to areas away from the crowds and gave us an understanding of the amazing history of Pompeii. He then recommend an itinerary for our time along the Almafi coast which included lunch at wonderful restaurant overlooking the coast. Our driver Carlo then showed us sites as we made our way through the towns along the Almafi coast. Thank you Fabrizio & Carlo!!! The trip to Pompeii was well-received. My family spoke very highly of Fabrizio. Fabrizio was fantastic to work with! He was such a great guy. He knew his stuff. Our driver Carlo was also awesome. Such a gentlemen. We definitely would use their services again if we ever get the chance to visit Italy again. Fabrizio was excellent. He was very knowledgeable, considerate of our needs and he had a great itinerary set up for the time we had available. We would highly recommend him and his services. TOUR GUIDE RESPONSE: Thank you Julie! I cannot say enough good things about Fabrizio. He had a spring in his step throughout a long day of travel. He shared with us his extensive knowledge of music, history, archaeology, local vegetation, and Italian life and culture. He adjusted the schedule to allow for weather changes on Mt. Vesuvius, optimizing our view from the top. He is also a patient man who allowed us to choose the pace of our day. Every person in my family enjoyed getting to know him. Thank you, Fabrizio! Fabrizio was amazing.. truly delightful, knowledgable and a joy to be with! He listened to our wants and gave us exactly the type of touring we desired. I can't wait to return to Italy just to have Fabrizio guide me around again...!!! Fabrizio provided us an excellent overview of Pompeii, hitting many of the important sites within the ancient city. His expert commentary made what we were seeing come alive. His knowledge of the history, art and everyday life of Pompeii made the tour more interesting. Fabrizio knew how to strategically bypass crowded areas on a hot day and backtrack so as not to miss sites that we hadn't seen. He made the best use of our time. An excellent tour guide. Terrific tour for the children to help them enjoy and understand Pompeii. The games played during the tour helped keep them interested. It was fun for adults too and several commented on how much they learned. Fabrizio is outstanding in the way he shares his knowledge plus very patient with the young ones. If you have children ages 6-11 with you this is the tour to take. This was my 6th Pompeii tour and I still saw and learned new information. Fabrizio was extremely knowledgeable and had a great attitude. His van was very clean and it was clear he values and enjoys his work. I would definitely recommend his services. We were very pleased with the tour. Fabrizio is an excellent guide. My entire family loved the tour and the sights we visited. We fully recommend this tour. Excellent!! Fabrizio was an amazing tour guide for us in Naples. 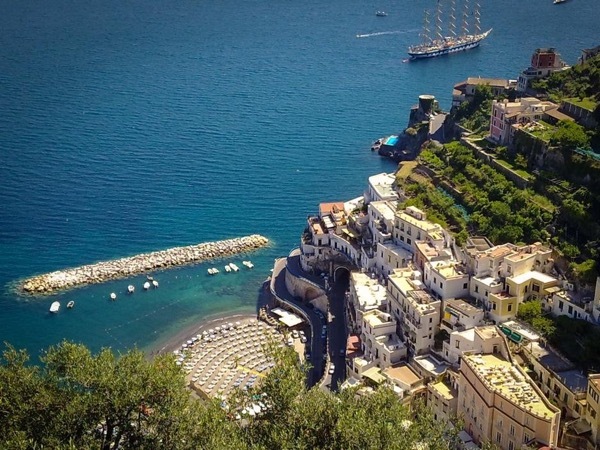 He took us to Positano, Sorrento and Pompeii in one day. We learned so much about the area and everyone enjoyed themselves. We highly recommend Fabrizio for anyone visiting Naples!! Without Fabrizio, we would not have fully appreciated the city of Naples. In his walking tour we visited churches, markets, and a museum. This gave us both a sense of Naples rich history and modern daily life. Highly recommended!